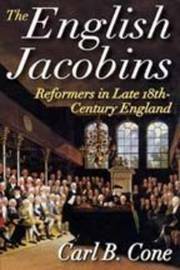 The English Jacobins is a full-scale study of the English reformers of the late eighteenth century, called ""Jacobins"" by their enemies who feared a repetition of the radical excesses of revolutionary France. Cone describes the rise of reform organizations during the controversy in Parliament over John Wilkes, who attempted to blow up Parliament in the 1760s, and he charts the progress of these organizations until they were disbanded, temporarily, after the sedition trials of 1794. Analyzing the goals and accomplishments of the reformers, Cone stresses that they worked for constitutional and civil not social or economic changes. The reformers were, in fact, more interested in restoring ""Anglo-Saxon"" liberties and the benefits of the Glorious Revolution of 1688 than in carrying out the ideas of Rousseau or borrowing from the example of the Paris Commune. If there were foreign influences on the English radicals, these were provided by former American colonists who had used committees of correspondence and constituent assemblies to such good effect against the monarchy. Cone considers the fluctuating fortunes of the reformers. At various times the radicals had important allies in Parliament, like Charles James Fox and William Pitt, and included in their number such accomplished figures as Richard Price, the moral philosopher, and Joseph Priestley, the chemist, as well as dissenting ministers. The ""Jacobins"" achieved their greatest publicity when Tom Paine replied to Edmund Burke's Reflections on the Revolution in France with his own Rights of Man and in the pamphlet war that followed. This intriguing work connects The American Revolution with the British Reform Movement, while documenting an important period in British history. Carl B. Cone (1916-1995) was professor of history at the University of Kentucky.